I like reading books about places. It adds extra layers of enjoyment to my travels, in Queensland and beyond. They can be learned and literary books, or lighter romances and mysteries; but sharing in the experiences of others, especially when they’re good observers, helps me to get under the surface of a place. 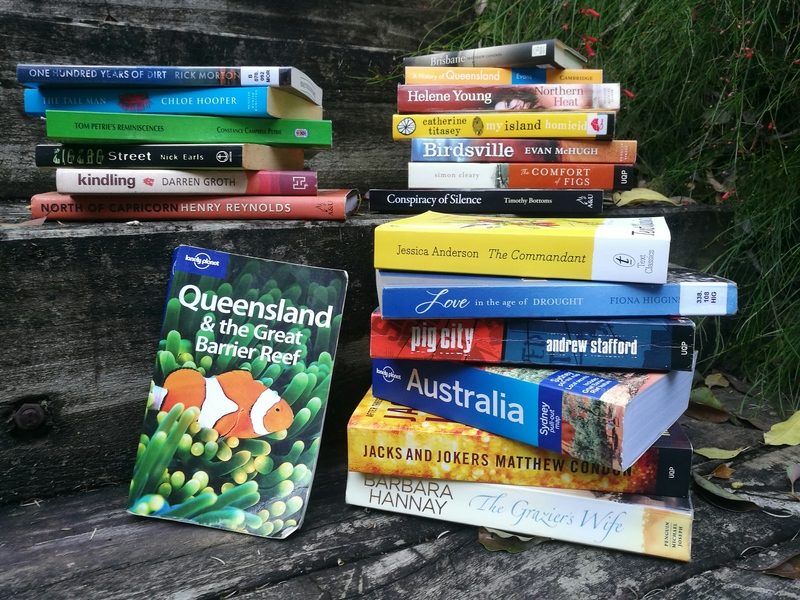 These are just a few of my favourite books about Queensland. Please add other titles in the comments section. I’m always looking for more. “The Commandant”, Jessica Anderson. 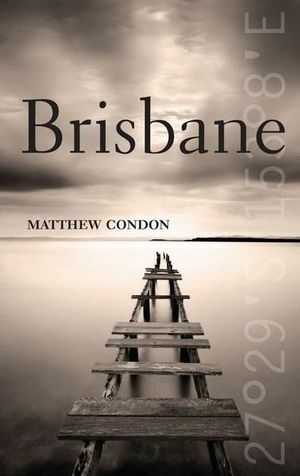 Fine, literary, perceptive novel of convict Brisbane under Captain Logan. Brutality and death in the penal colony as observed by the Logan womenfolk. “Carpentaria”, Alexis Wright. 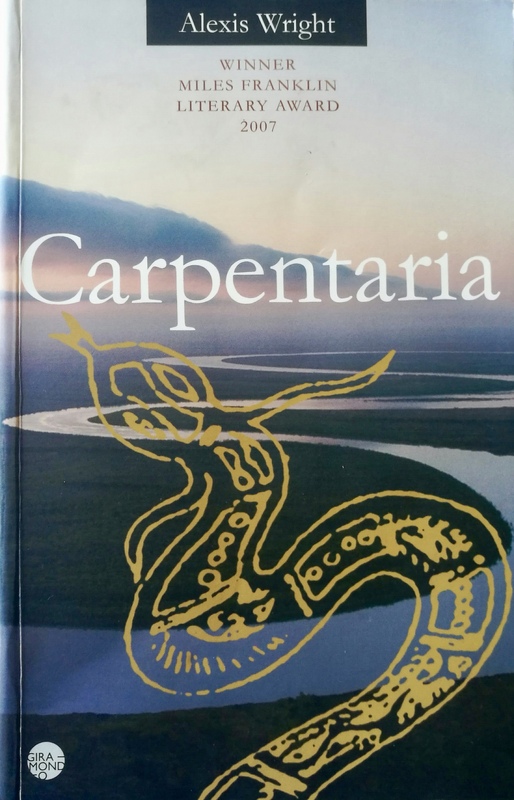 A magnificent literary saga of the Gulf of Carpentaria, written by an Indigenous Australian with a unique and accomplished voice and an authentic image of the land, its people and its mythology. In the tradition of Xavier Herbert. 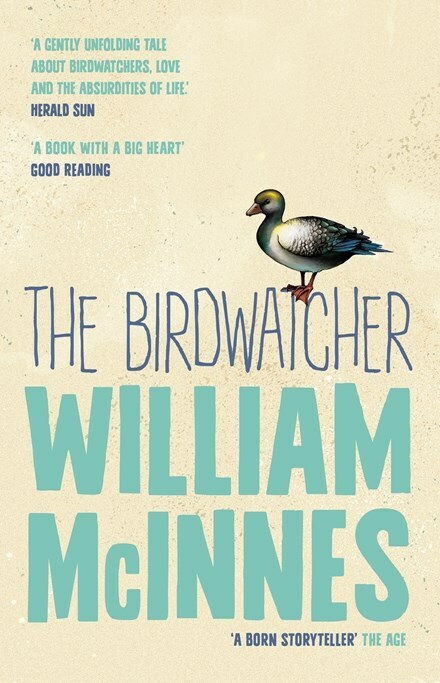 “The Birdwatcher”, William McInnes. A sweet, wise, grown-up love story set in Far North Queensland. Some ‘60s nostalgia, poetry, and lots of birds. 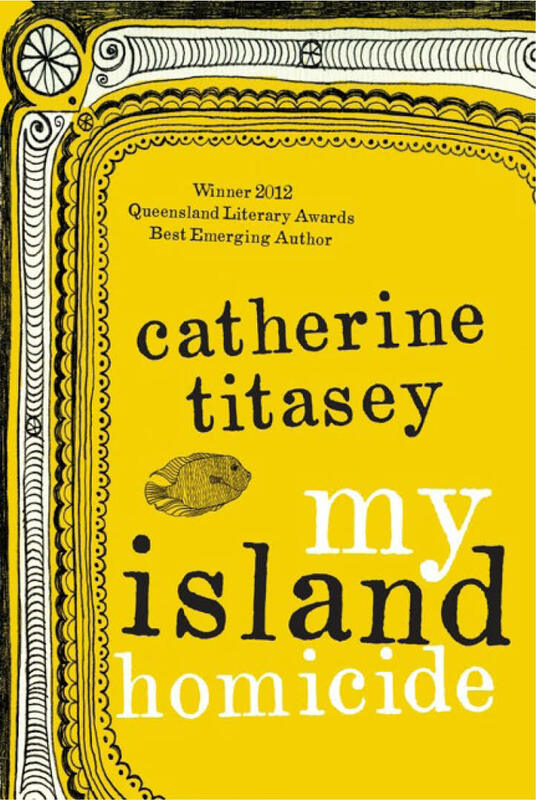 “My Island Homicide”, Catherine Titasey. Set on Thursday Island, this is a likeable romance/detective novel. 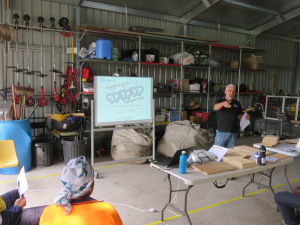 Authentic language and background in a fascinating part of Queensland. 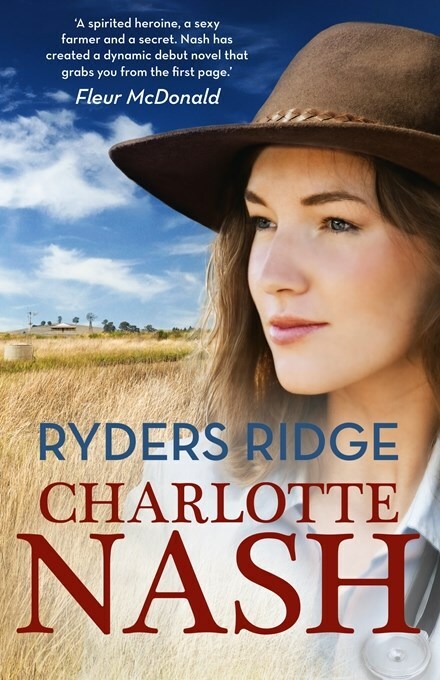 “Ryders Ridge”, Charlotte Nash. An enjoyable rural romance set in north-west Queensland. Red dirt, big hats, doctors. 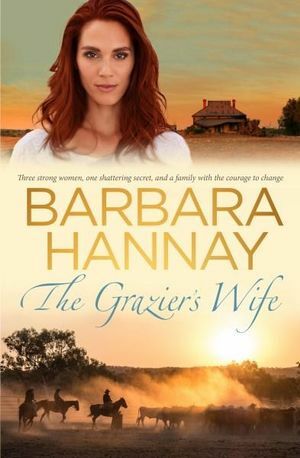 “The Grazier’s Wife”, Barbara Hannay. 2017. A multi-generation rural romance set on the Atherton Tableland. Cattle, rainforest, Singapore, antiques, a secret will. 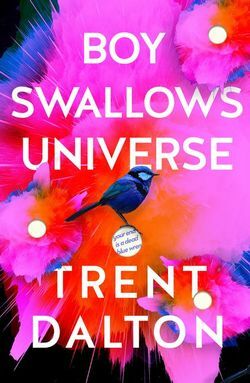 “Boy Swallows Universe”, Trent Dalton. 2018. Enjoyable, scary, uplifting, suspenseful story of growing up in a crime-affected family in Brisbane. Darra and Bracken Ridge, Boggo Road Gaol and City Hall. Violence and love. “Border Watch”, Helene Young. 2011. A FNQ romantic thriller written by an ex- airline captain and Border Patrol pilot. 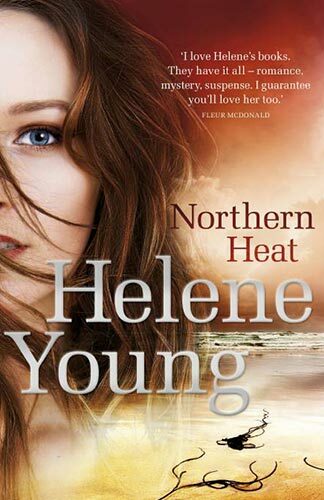 One of several novels by this author set in Queensland including “Safe Harbour”, 2014, and “Northern Heat”, 2015, which is set in Cooktown. “Lonely Planet – Queensland and the Great Barrier Reef”, and “Lonely Planet – Australia”. The first covers the tourist areas and the coast; the second covers the inland areas of the state. Lots of interesting local information. 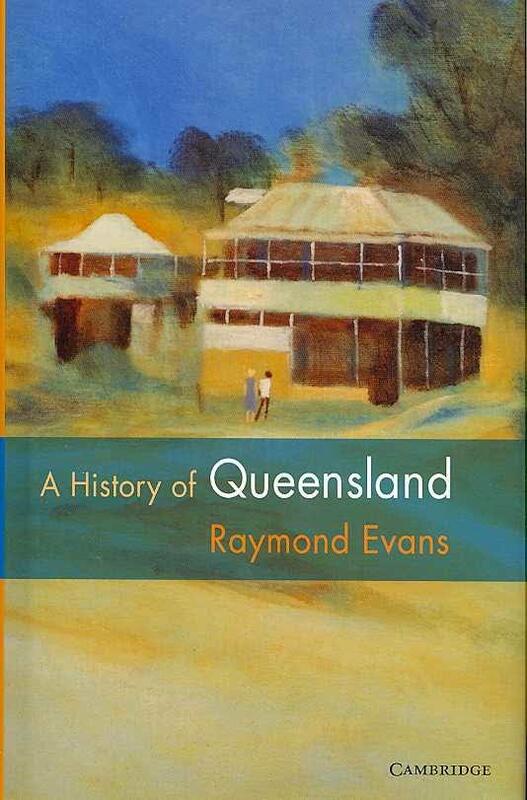 “A History of Queensland”, Raymond Evans. 2007. Interesting scholarly in-depth account by a well-known historian of Qld life and development from earliest human habitation to the 2000s. 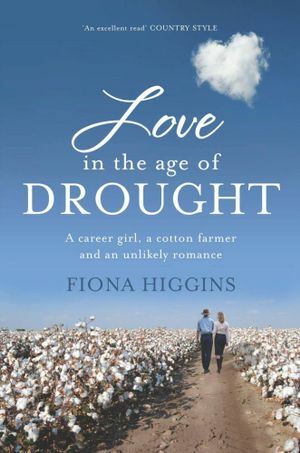 “Love in the Age of Drought”, Fiona Higgins. 2009. The memoir of a Sydney woman who marries a farmer from Jandowae, on the Northern Darling Downs. 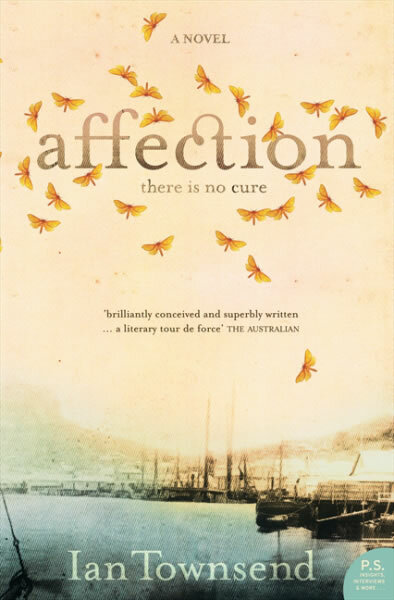 Love, drought, life in a small town, the black soil plains west of the Bunya Mountains. I lived here as a teenager. “Birdsville”, Evan McHugh. 2009. 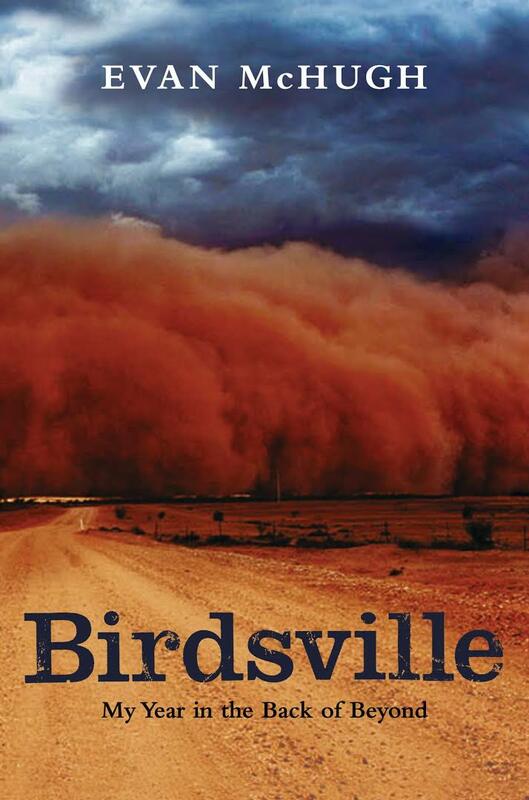 Dust storms, bogs, sand dunes, race meetings, rescues, locusts, building a golf course in the desert: a Sydney freelance writer and his graphic designer wife spend twelve months in Birdsville. 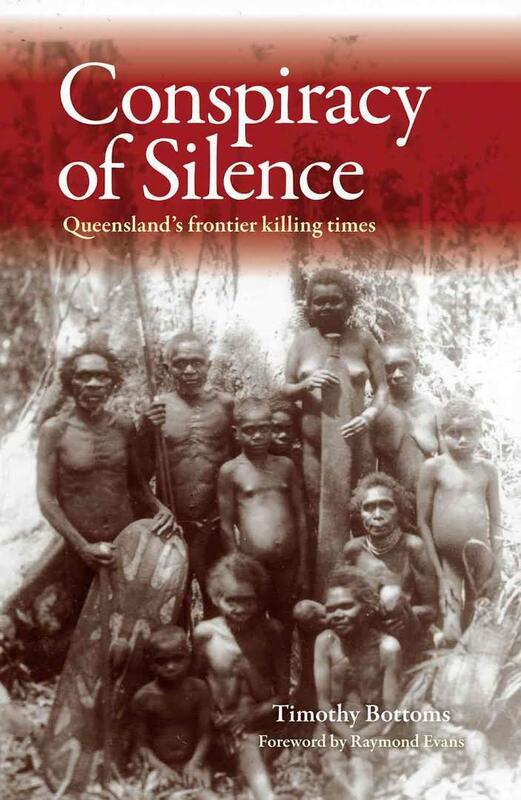 “Conspiracy of Silence: Queensland’s frontier killing times”, Timothy Bottoms. 2013. Harrowing account of the acts of violence that accompanied pastoralists’/investors’ seizure of Queensland pastoral land from Aboriginal inhabitants. 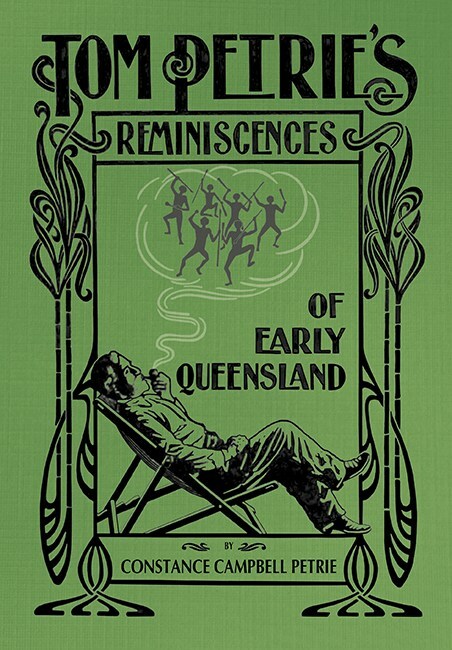 “Tom Petrie’s Reminiscences of Early Queensland”, Constance Campbell Petrie. Re-published 2014. This important 1904 book details life in Brisbane and South-east Qld from 1837, when little Tom Petrie arrived at the convict settlement of Moreton Bay with his family. 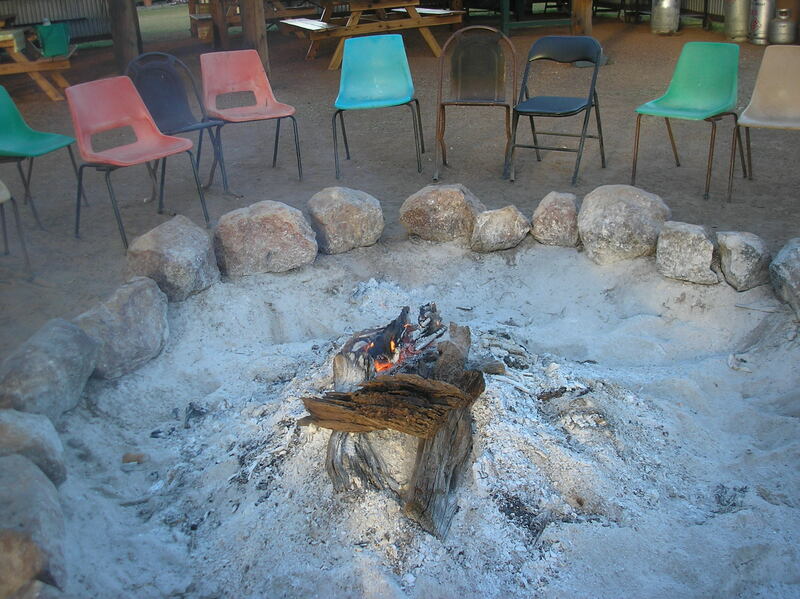 Local Aboriginal people, their foods, customs and language, as well as convict life and early white exploration. 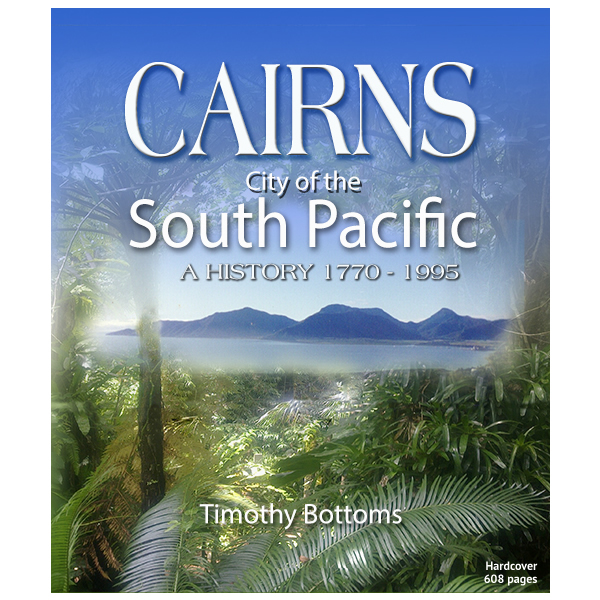 “Cairns: City of the South Pacific. A history 1770-1995”, Timothy Bottoms. Interesting, ambitious, detailed work. I like this article about the Gracemere Saleyards. The Roma Saleyards are interesting too. Provides a glimpse for a traveller into the real life of a place. 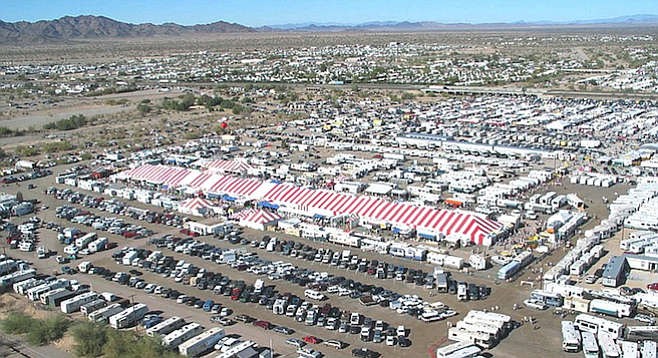 As Con drives, I’m looking online for a place to spend the night. Bowen will be a convenient place to break our trip. 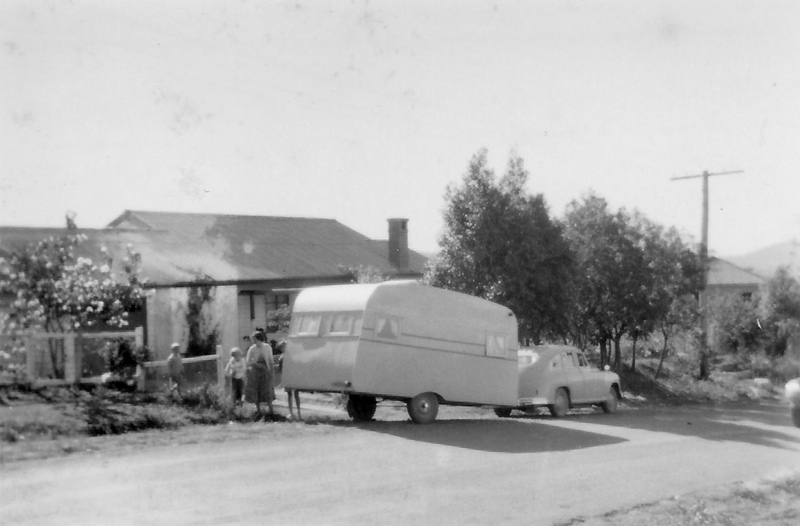 In 1963, on a road trip with my family, we put up Dad’s old army tent in a caravan park in Bowen. It was a depressing spot, squeezed up against a fence, down by the wharf. Bowen the Beautiful – No Place More So! said the tourist brochure. I’ve since taken a closer look at Bowen. Queens Beach is indeed beautiful, and Horseshoe Bay is one of the sweetest spots in the country. 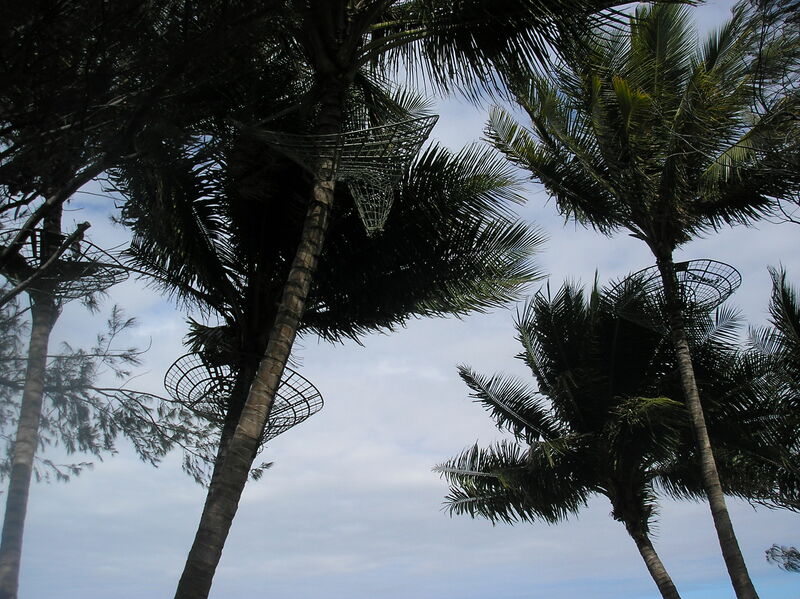 I like the way the coconut palms here wear upside-down skirts to stop the coconuts from falling on people’s heads. 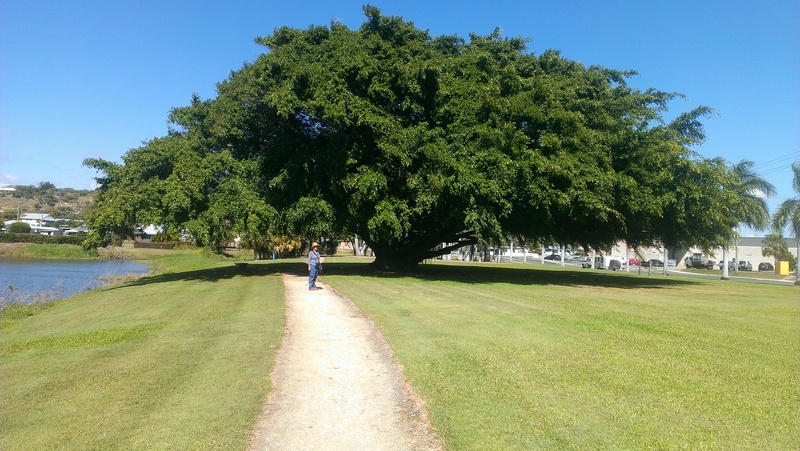 I like to walk around Mullers Lagoon and stand under the shady umbrella of the biggest fig tree I’ve ever seen. 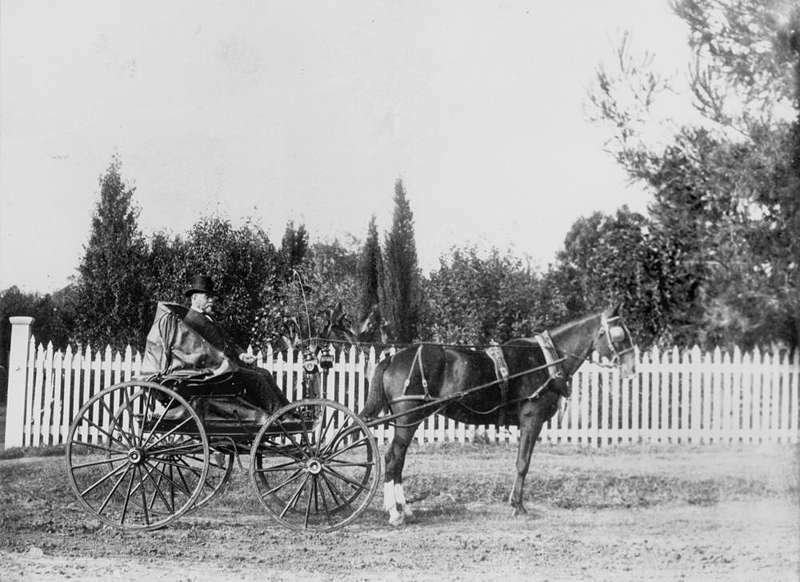 Herbert Street, which sweeps grandly down the hill to the harbor, was named after Queensland’s first premier, and Bowen itself after Sir George Bowen, the first governor. This was North Queensland’s first port and first major settlement, retaining its stature until Townsville was developed, two hundred kilometres to the north. It still has a feeling of the important centre it was intended to be. Bowen has had time in the spotlight. 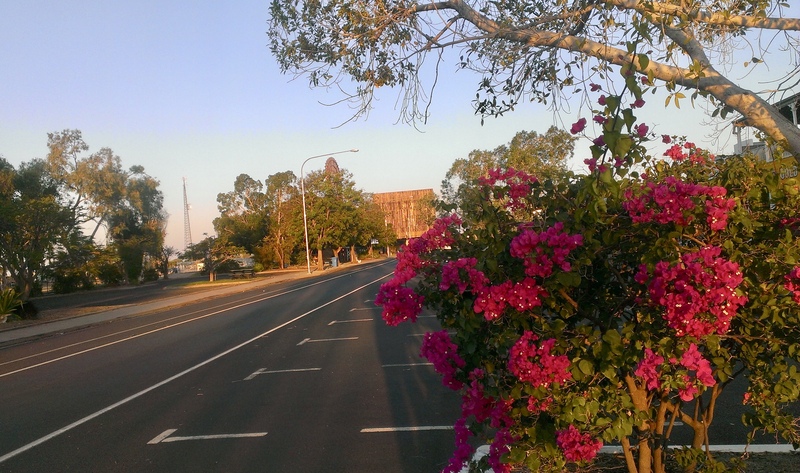 We last visited in 2007 while scenes of Baz Luhrmann’s epic movie Australia were being filmed here, with Bowen’s harbour standing in for Darwin Harbour, and the Grand View Hotel, since lavishly renovated, made over as a bombed-out ruin. Bowen also boomed with the mining boom, and perhaps is now suffering, as Mackay is, from the consequent bust. I’m fussy about motels. Con and I have stayed at some dodgy ones over the years. An old-style air-conditioner in the corner roars all night, too far from the bed for us to feel the cool air it may or may not be producing. The bed is hard, the sheets are short, and the bedspread is a multi-patterned affair, designed to hide stains. The room is never quite dark. There are tiny lights on smoke detectors, air-conditioner, clock, television and microwave. Security lights peek through the curtains where they don’t meet properly no matter how hard you yank them together; headlights flash across the ceiling as people arrive late or leave early. The milk in the small, noisy fridge is the long-life variety, and the freezer section isn’t cold enough to actually freeze anything. Everything reeks of that scented cleaning product found only in motels. Things have improved a great deal in recent times, and very few motels have all of the above. These days, road workers, railway workers and tradies stay in country motels. It’s common to see loaded utes and work boots outside rooms, with a bloke in a high-visibility shirt having a beer next door. These hard-working people want a good night’s sleep. Now there is always hot water in motel showers. The television works, the air-conditioning is efficient, the beds reasonably comfortable. The bedspreads haven’t changed, though. Up to a third of travelling time is spent in accommodation, so it should be a pleasurable experience. Location, security, comfort and affordability are essential, but atmosphere, charm and hospitality also rank high with me. I don’t mean a Bed and Breakfast place packed with crocheted doilies, potpourri and milk churns painted with roses. A friend told me about a B&B where the bed was decorated with boy and girl rag dolls, leaning against the ubiquitous stack of ornate pillows and cushions. When she and her partner came back from dinner, the covers had been turned down and the boy and girl dolls were cuddled up together in bed. Here in Bowen, on a previous trip, we stayed in one of the best motels I’ve ever come across, for hospitality, amenities and comfort: the Bluewater Harbour Motel. We won’t stay there tonight, because it’s off the highway and we’re in a hurry. In the end, I decide on the Ocean View. 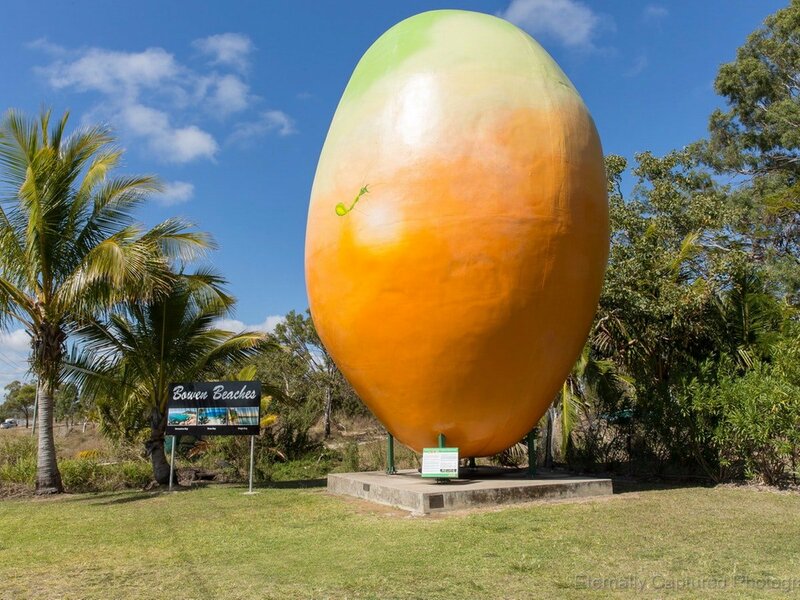 I’ve noticed this place over the years, positioned above the highway south of town, next to the Big Mango, with an outlook over the sea and the islands. According to the online description, it also provides dinner. 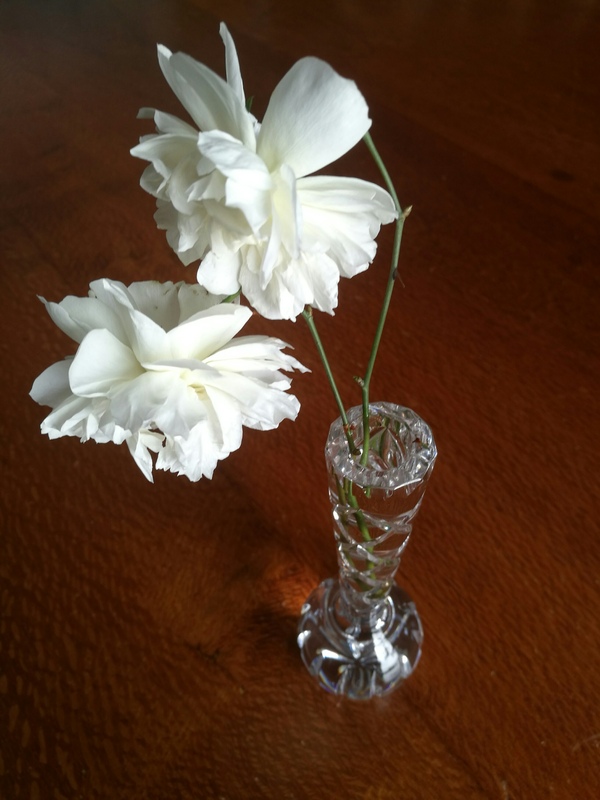 We check in in the late afternoon, and eat our simple meal on the verandah, looking past a flowering frangipani at the lights of Bowen across the bay. This is not exactly the Bowen Hilton, but it is comfortable, the situation is beautiful, and it turns out that the manager was best man at Con’s niece’s wedding. In North Queensland, that’s the way of things. Everyone is connected. It’s all good. But next time we come, I want to have a shot at the Bowen Arrow. January 2000. Blazing heat and a bright blue sky. 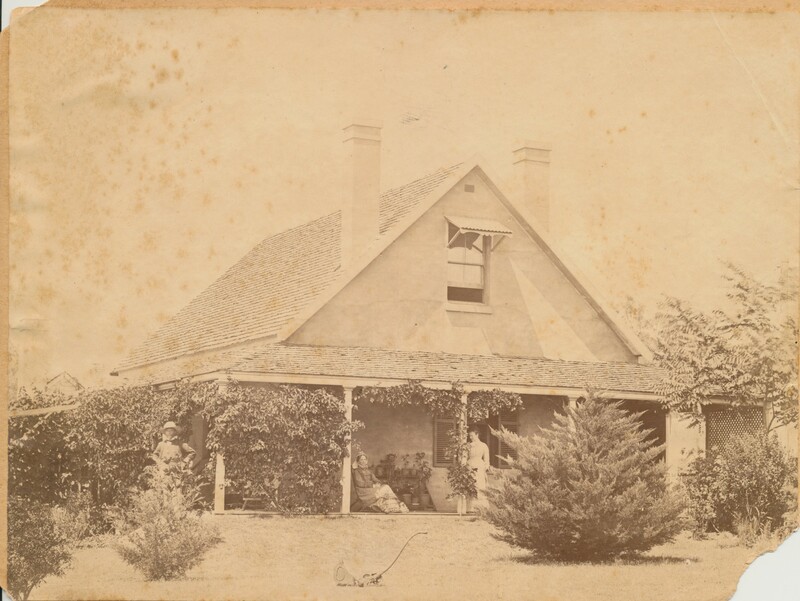 Oak Street was still strung with Christmas lights, but nothing much was happening in Barcaldine. The tourist season had not yet begun. 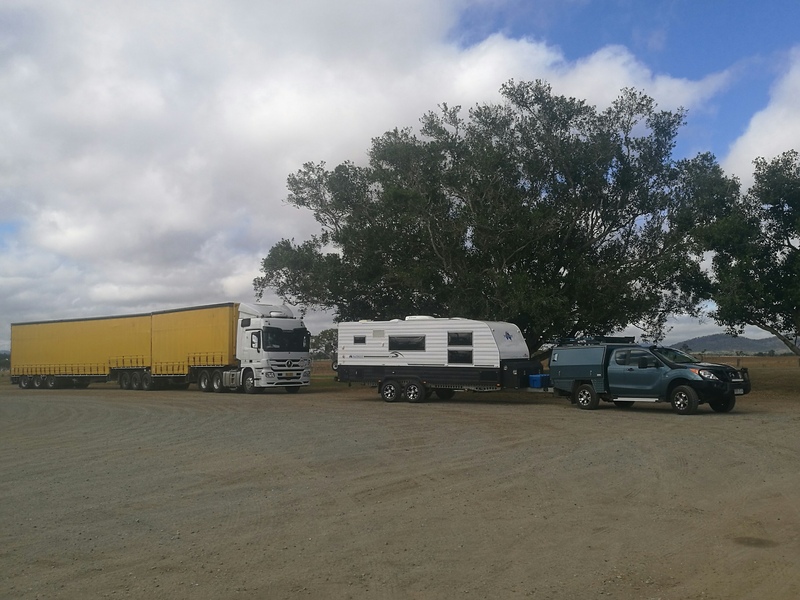 You forget, on the Coast, what it is like to drive in the West: on-coming drivers lift a finger off the wheel in laconic greeting, emus and kangaroos lurk in the roadside scrub; trees in the paddocks are levelled off along the bottom where sheep and cattle have reached up to pull at the leaves. Con and I had driven two days from Brisbane and arrived on what would have been my mother’s eightieth birthday. She was born here in Barcie. 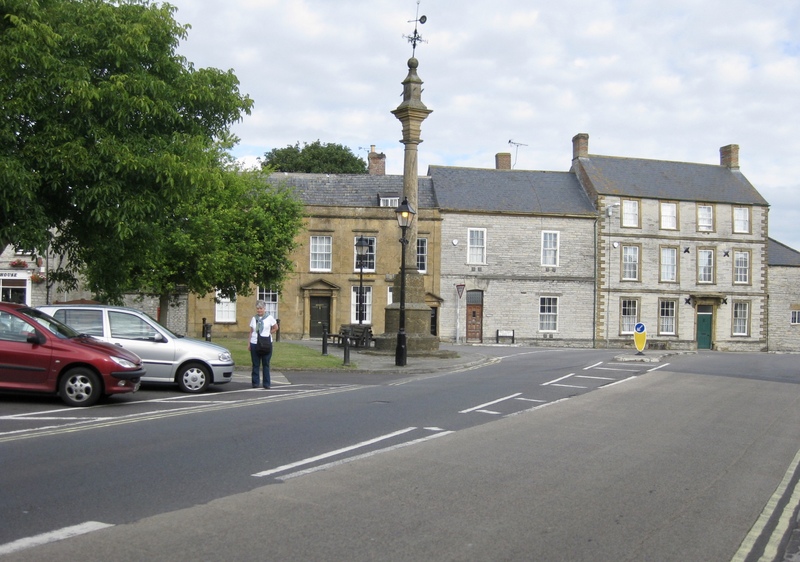 The town is important in my family history. I’d driven through in previous years, but now I wanted to spend a bit more time here. That Sunday evening, we asked the motel manager where we could eat. 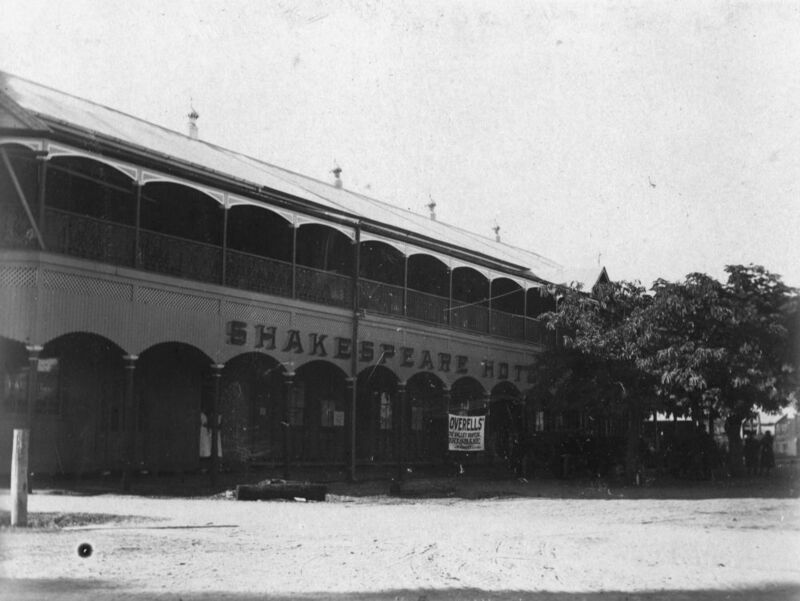 In the Central West, Barcaldine, population eleven hundred, is a classic country town, a flat grid of streets with a row of pubs looking out across the railway line: Globe, Commercial, Shakespeare, Artesian, Railway, and Union Hotels. The streets are named after trees. 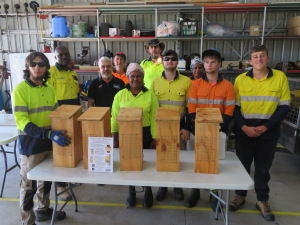 Barcaldine was the first town to provide town water from an artesian bore, and it still calls itself the Garden City of the West. 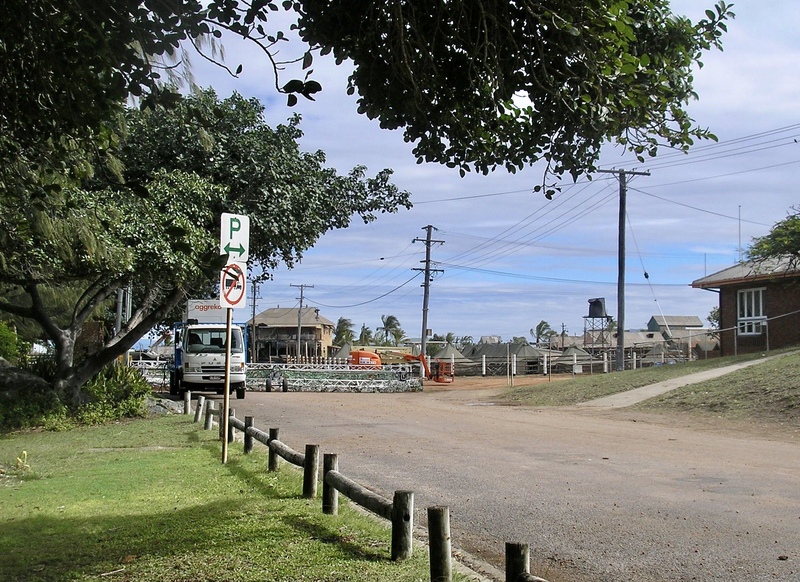 This is an important town on the tourist route, situated on the junction of the Capricorn and Landsborough Highways. 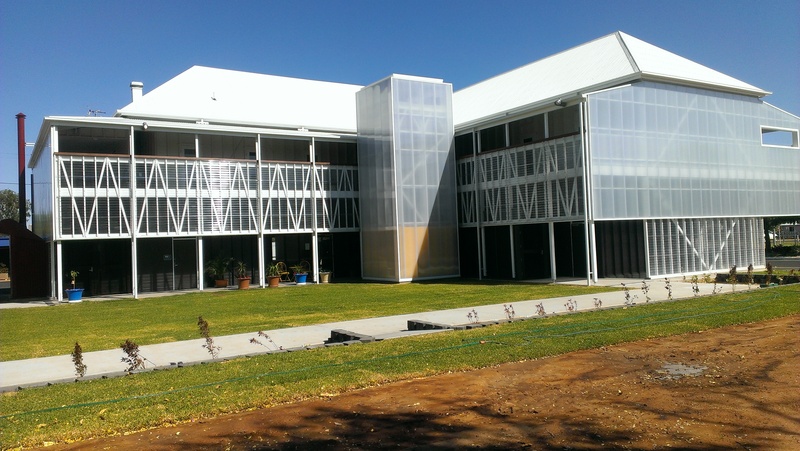 Barcaldine is also important in the history of politics and industrial relations in Australia. Troops were based here during the great shearers’ strike of 1891, and this was where Australian soldiers first wore emu feathers on their slouch hats. 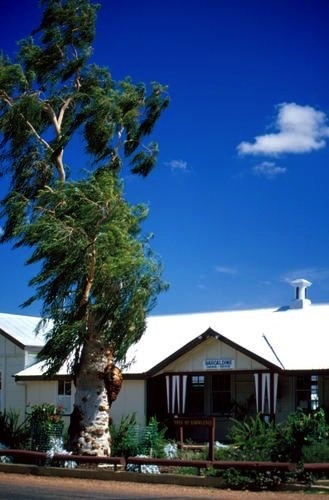 Meetings of the striking shearers famously took place outside the railway station, under an old eucalyptus tree, a ghost gum, that came to be known as the Tree of Knowledge. By 2000 the tree was showing its age. Six years after our visit, causing distress locally and nationally, the Tree of Knowledge was poisoned. If anyone knows who the poisoner was, they’re not telling. 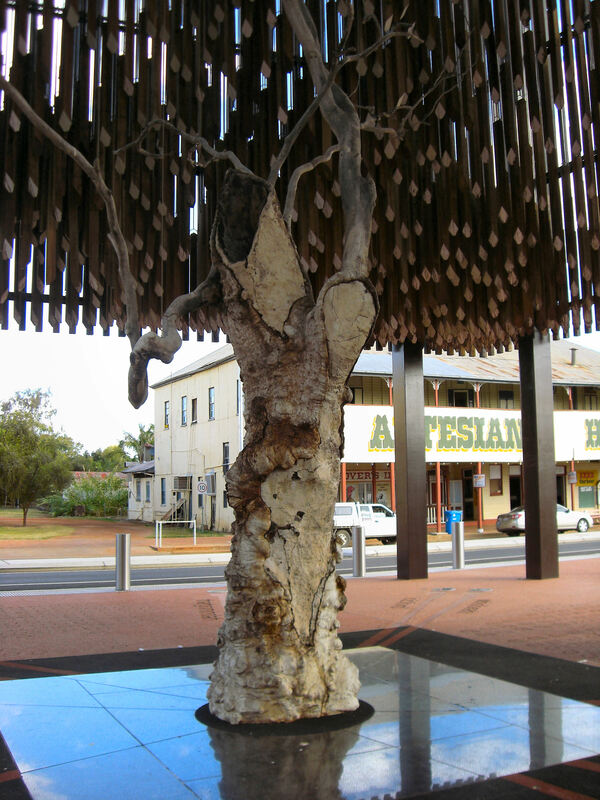 Then, in 2009, the astonishing Tree of Knowledge Memorial was opened on the site where the old tree had stood, outside the station, across the road from the Artesian Hotel. Built with Commonwealth funds, the Memorial consists of a high cube of timber, startling in that flat country with its traditional roof-lines. Inside, above the dead trunk and branches, old railway sleepers hang suspended, outlining a ghostly image of flourishing foliage. At night the tree is lit up in green, a moving and spectacular sight. Eucalypts propagated from the old Tree of Knowledge in Barcaldine are flourishing next to the State Library of Queensland, in Brisbane. Don’t tell the poisoner from Barcie that they’re there. Back in 2000, a publican gave me a local perspective on the political significance of Barcaldine’s hotels. Six hotels are a lot for a small town to support. By 2011 the Globe was up for sale, possibly to be demolished. Huge old timber hotels with deep verandahs are the architectural treasures of Queensland country towns. So many of them have been lost through fire; I was sad to think that such a building, with so much history, could be pulled down. I paid another visit to Barcie in 2015, with my cousin Nadine, searching for family history. To my delight, I discovered that the Globe has been preserved. It was bought by the local Council, and the designers of the Tree of Knowledge Memorial were commissioned to renovate it. It now stands in its original form, preserved and enclosed by elegant metal screening. What used to be the bar is now the Information Centre. Upstairs is an art gallery. This exciting renovation is currently being showcased at the 2018 Venice Architecture Biennale as part of the Australian exhibit titled “Repair”. During our 2000 visit, Con and I saw in the bar of the original Globe some large Hugh Sawrey paintings, based on Banjo Paterson poems. Con, loving horse racing as he does, especially liked “Old Pardon, the son of Reprieve”. In 2015, over dinner in the motel restaurant, Nadine and I talked to the waitress about our family history trip, and I mentioned the spectacular preservation job on the Globe. I hope those paintings make it back to the Globe.